It is no secret Buba is tall for his age. He is fast outgrowing his little toddler bed that I hoped he would be in until he was long into school before I had to start my search for his big boy bed. Unfortunately with him starting school in September and his head and feet nearly touching both ending of the toddler bed it’s time to start my search early. Another thing that will be pushing me to find his big boy bed is Missy Moo is nearly two years old now. I know! I can’t believe it either and will need a toddler bed which I will be gifting Buba’s toddler bed to her. We have been lucky enough with their age gap that every time Missy Moo is about to move up a stage, Buba is about to grow out of it. We have saved loads just using Buba’s car seats, cribs, nursery sets, and even many of his baby clothes. This will not be an easy search for me for a few reasons. First and foremost I am trying to save money by giving Missy Moo his toddler bed and his dresser and selling her entire Mamas & Papas nursery set together. This leaves Buba without a bed and dresser. Secondly his room is the smallest and weirdest shaped room ever. It’s the room above the garage with part of it jutting out over the garage and all windows with a small radiator under the windows leaving that space utterly useless. (Thanks design team). So I have a tricky task at hand. How do I fit a single bed, dresser, little desk, and wardrobe in an L shaped small bedroom for him. I want to utilize space but I don’t want it to be cramped in there either. 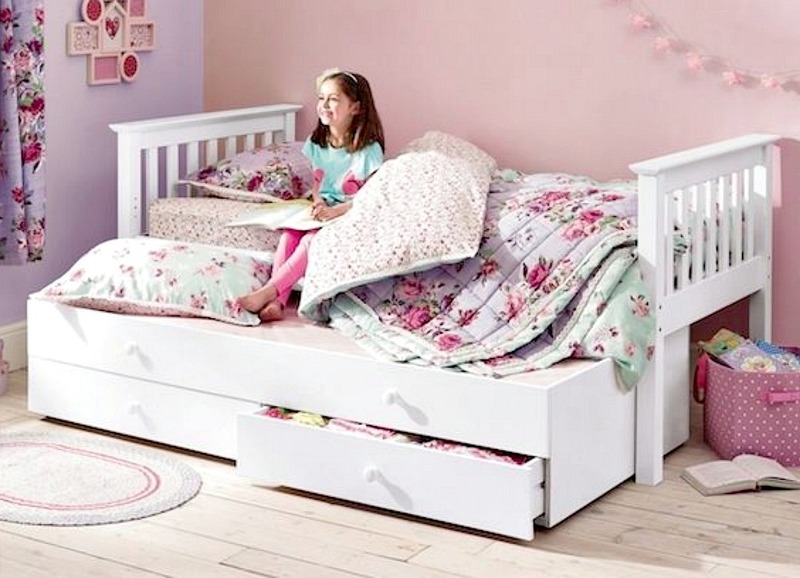 I have started my search and here are a few great options for kids’ small bedroom furniture that will provide storage and space to play around at the same time. I love the unique and trendy look of these two beds below. Both give you extra space for either an extra bed or storage and bring a great vibe to any bedroom. 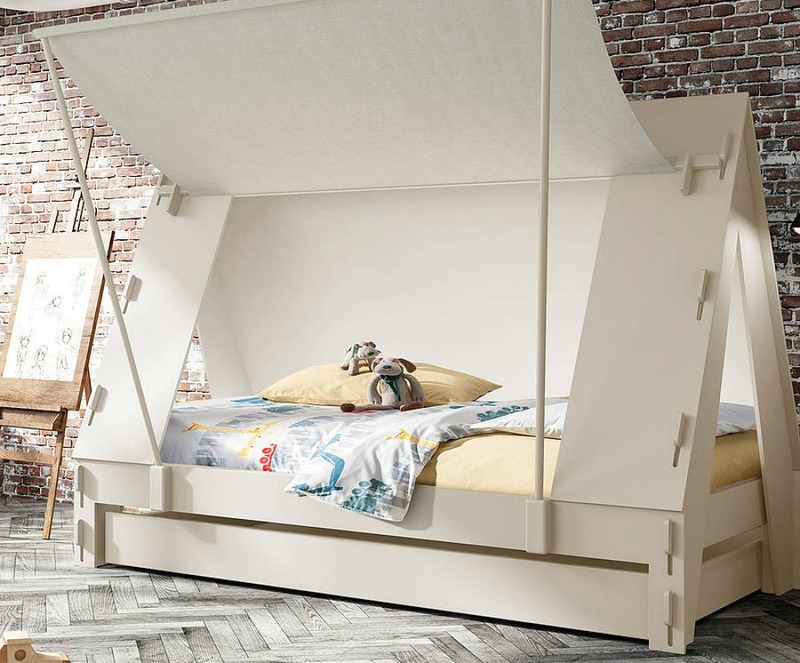 For me, this tent bed rocks and if we had it for Buba’s room I would minus the extra bed underneath and use it for drawer storage and not buy a dresser. 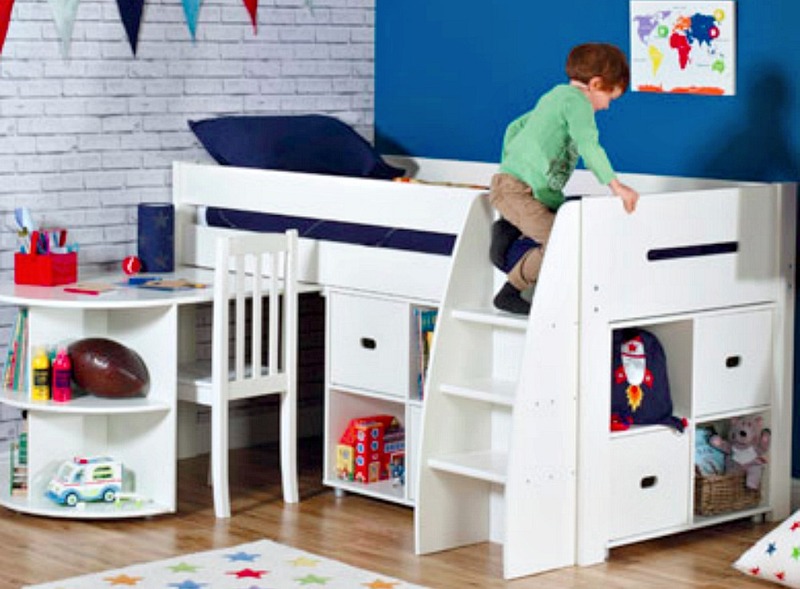 The Loft Bed is great too for an added space to read and store toys in their toy box underneath. I mostly love it for it’s Scandinavian style. 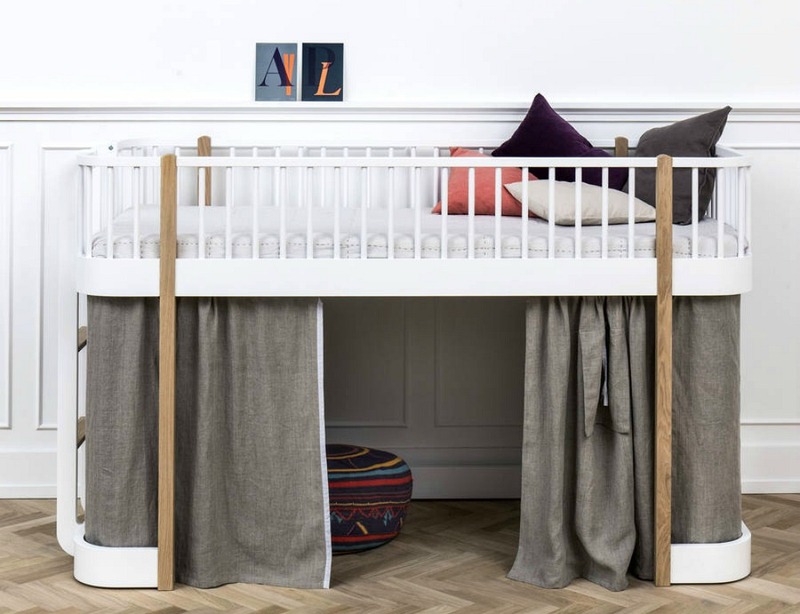 With small kids’ bedrooms space savors are a must. I came across these two in the Next catalogue and I am leaning towards more practical. They have everything I need all in one unit which does what it says ‘saves space’. The desk would be perfect for Buba for his homework, it’s not too high off the ground and has a rail for safety which I like. I looked at bunk beds and they were higher and I don’t think he would be ready for that just yet. 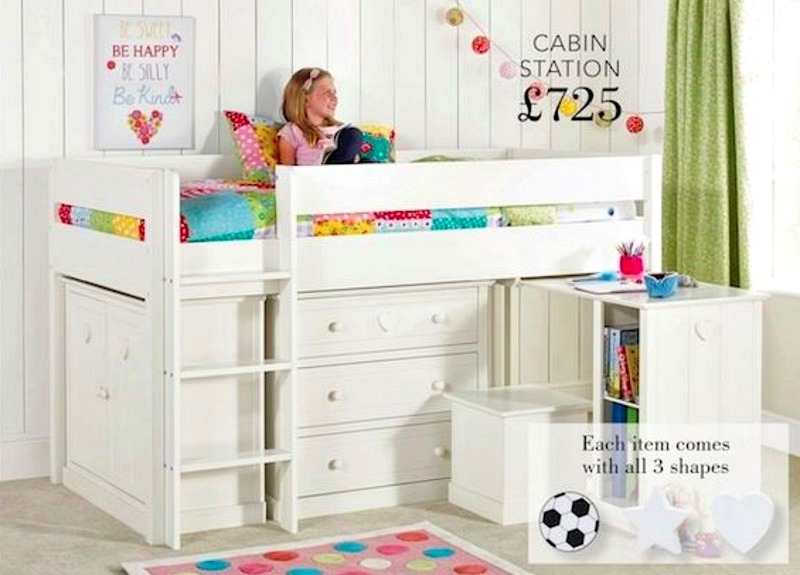 The first Cabin Bed was high on my list as it has a dresser underneath, storage toy box for a chair to the desk and a side cabinet for more storage. In small spaces with children storage is EVERYTHING. At £725 I am highly thinking about it. It would cost me that to buy a desk, bed, and dresser all separate if not more when I break it all down. The lower bunk bed one is similar just has two storage units instead of the dresser but I could easily get some nice canvas boxes for it and bring more color into the room and use those for socks, underwear etc. I keep going back and forth between what he needs and what we might need too. We have one spare bedroom but my family is huge and when they fly over to stay we need more space. The more sleeper beds with pull outs are great for this or any friends sleep overs he may have when he is older. I liked this one because it has a pull out bed and still has two drawers for storage underneath that. For boys you don’t necessarily need a lot of drawers they have socks, pants and boxers that’s it. With Missy Moo her drawers seems packed with socks, tights, shorts, skirts, leggings, pants etc. the list is endless. I think I could get away with this in his room and get a small desk next to it. Overall, it’s just about what I want it to look like. It’s hard to make good decisions. I want it to last, be practical and not cost me a small car price. I love doing my research and we probably won’t be making a decision until we are back from America in August but until then I will keep skimming the interest for quality, bargain space savors for my son’s small bedroom. What are your thoughts? Have you had one of these types of bedrooms for your children? Any negative or positives on them? Love to hear your thoughts? Oh that’s a great idea. I might out MM into a single bed straight away too. I love the idea of play area underneath. Buba could use that as his room is tiny. Thanks for the tips. Oh that’s great news babes. There are so many options my head is spinning and I don’t know which to go for Bubas room. And then Missy Moo room eventually too. Glad to give some ideas. Thanks Lucy. I am leaning towards the one with the desk. Can you repaint the furniture white to lighten the room. Get those corner shelves for storage. That’s so sweet Yasmin has a room at Aunty’s house. Love it. I had a captains bunk with a desk and wardrobe underneath it when I was a child and I loved it – the only thing to think about if you do go for a higher bed is to make sure there’s somewhere safe at the higher level to put Bubba’s glasses – even if he doesn’t reach for them straight away now, he probably will as he’s older and my trick of tipping upside down over the edge of my bed to reach for them off my desk probably isn’t the best idea!! I am having similar research trauma as you Jenny ! We are looking to redo our 9 year olds room this year. She is in the small box room and I was looking at the very same cabin bed to give her more storage. However I think we have decided to go for a bed from Ikea with drawers underneath and keep the Mamas and Papas wardrobe we have had for 13 years. It still looks brand new ! Looking forward to giving her room a fresh new look as sadly she is growing out of Disney Princess now. There is so much choice out there I felt like I was going round in circles at time ! Exactly how I feel. Too much choice and decisions to make. Oh so true I bet it does. Mine would probably too. That’s why I think I am leaning towards the one with drawers and shelves underneath so I can’t use it as a dumping ground. lol Thanks for popping over. Thank you. I know I am spoiled for choice and I dont’ know how to decide. Thanks Karen so lovely for you to pop over and comment. We are in the cotbed stage too for MM so we have two to decide what to get for the next stage. They grow up so fast don’t they?